FDGAO Portable Charger is also a Qi wireless charger, not only a power bank. Used as a wired charger: it is compatible with all smartphones, PSPs, iPads, cameras and more. Convenient to use : put your phone on the charger and begin to charge. Turn on the switch before using wireless charger power bank. 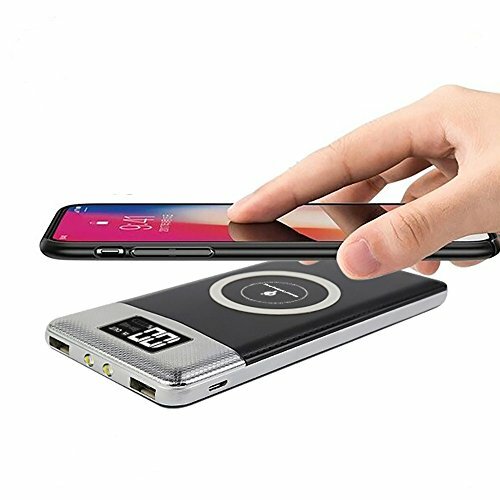 FDGAO Power bank built-in smart chip, when the power bank connect the device the battery will be automatically starts, if not connected to any device, the power will be closed after 15 seconds. Double-click the switch to turn on the LED lights, and Double-click the switch again, the LED lights will turn off. Approved by QI,CE,ROHS and FCC for quality and safety. (2) When the power bank can't be recharged, please click the power button and replug or replace the cable to activate the unit. (3) We are offer 24-hours customer service and 12-months product warranty. If you have any problem, please contact us first, we can solve it within 24 hours. High Capacity: FDGAO Portable charger built-in 10000mAh polymer external battery pack, can fully charge iPhonex 3 times, Galaxy S6 2 times, iPad mini 1 times, with most phones you will get 2-3 full charges of your phone. Smart System: FDGAO Power bank built-in smart chip, it can automatically detect the best charging speed for Android or iOS devices, 10000mAh power bank have dual output ports, can charge 3 devices at the same time. Wired and Wireless: This FDGAO Portable Charger is also a Qi wireless charger, not only a power bank. Used as a wireless charger, it is compatible with iPhone 8/8 Plus/iPhone X ,Samsung Galaxy Note8/S8/S7/S7 Edge/S6/S6 Edge/S6 Edge +/Note 5. Used as a wired charger, it is compatible with all smartphones, PSPs, iPads, cameras and more. Fashionabe and portable: Made of ABS + PC flame retardant material, equipped with two super bright LED lights, feel comfortable, stylish, easy to carry. If you have any questions about this product by FDGAO, contact us by completing and submitting the form below. If you are looking for a specif part number, please include it with your message.